Queen Rania with activists women in Ma'an. Her Majesty Queen Rania Al Abdullah visited the governorate of Ma’an and met with a group of women activists on Thursday, November 8, 2018. 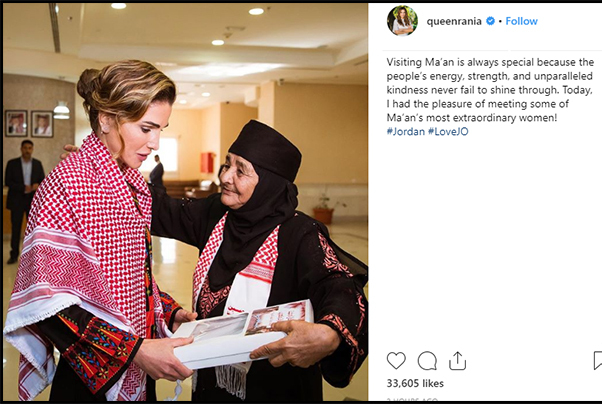 Following the visit, Her Majesty added a photo on Instagram with the caption: "Visiting Ma’an is always special because the people’s energy, strength, and unparalleled kindness never fail to shine through. Today, I had the pleasure of meeting some of Ma’an’s most extraordinary women!" Queen Rania met with local women active in the fields of education, art, medicine, and social development at the Prince Hussein bin Abdullah II Cultural Center, where she was received by Ma’an Governor, Ahmad Omoush, and the center’s director, Yousef Shammari. During the meeting, the Queen noted that Jordanian women are making significant advances in many fields and securing leadership positions in all industries, commending the women of Ma’an for overcoming obstacles through their unwavering determination.